Chasing a return to the grand final series after a semi-final exit last year, Townsville Fire have compiled a 9-5 record and have only lost to Sydney (once), Perth (twice) and Dandenong (twice). 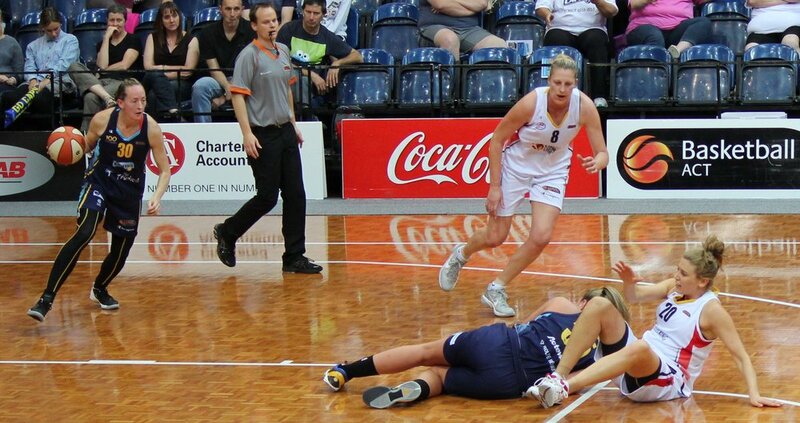 Townsville Fire captain Suzy Batkovic has put up 20 and 10 a game in another productive campaign. With the evergreen Suzy Batkovic again in MVP contention and the returning Cayla George helping out with both points and rebounds galore, the Fire are in second place as the league approaches its final leg. They have clamped down on sides in defence and have crashed the boards, leading the league in total rebounds. At their best, they have been brutal, walloping Adelaide by 42 and putting together a faultless 3-0 record against pre-season favourites Melbourne, Here, coach Claudia Brassard reflects on a mainly successful campaign to date, touches on the Fire’s deep rotation and sees room for improvement in her veteran squad. It’s been something of an up and down season for Townsville, but is it fair to say that the Fire’s best has been as good as anyone’s? Yeah, it’s definitely been a year where it’s hard not to be a bit up and down with the league being how it is. We have to travel the most, more than Perth even, the season goes 13 weeks and we’re on the road 10 of those. So, it’s been that little bit harder this year to be consistent week to week. That leads into the next question. How have you dealt with the condensed schedule this year? Have you been tempted to use the second unit a bit more? We prepared for it as best as we could, we've got some of the older players now, but we recruited for that and we definitely wanted to go ten deep. Other teams can get a bit weary. If you look at Sydney, they tend to play Katie-Rae (Ebzery) 38 minutes plus and at Dandenong, they are playing Steph (Blicavs) 38 minutes plus. Hopefully we can have a bit more depth and take advantage of that. One thing Townsville are doing well is defence, conceding less than 70 points per game. But do you think there is even more improvement to come on that end? Yeah, we would like to think so. But one thing that we’ve talked about is our defensive rebounding and we agreed that we need to do better there. Perth Lynx are probably the team that have given you the most trouble this year. Do you see them as the main contenders at this point? Yeah, I think so. They’ve been very tough. Nobody has really worked them out, have they? I think they’ve won nine in a row now and they’ve been very dangerous and obviously they have those very dominant guards. Townsville were only seventh in fast break points last year, but are up to second this year and are also first in points from turnovers. Was this something that you specifically worked on? It wasn’t something that we initially looked at, but I think that’s come about from how we put our roster together. We can defend and be really physical and put pressure on teams and we can go ten deep. We wanted to have that depth. How have the two imports (Laurin Mincy and Sydney Wiese) done in terms of adjusting to the league and how it is officiated? Their attitude has been great and they’ve fitted in really well, they’re definitely digging into some Australiana now. They’ve been great, in terms of attitude and working hard and buying in, so we’ve been really happy with them actually. Townsville are only 7th this year in 3 point percentage. Is it a matter of not getting open looks or are the shots just not falling? We certainly struggled at the beginning of the season with hitting those shots. At first, we just weren’t hitting them but we went back and looked at the videos and we felt that we did get good looks, but they just weren’t going down. Now, they are, thankfully. Hopefully that continues and that percentage can improve. With some teams having fallen out of the finals race is there a danger of complacency when you come up against them? Yeah, I think so. Both of those teams, Bendigo and Canberra, they actually have very solid starting fives. They’ve just had some unlucky things go against them and that’s why they’ve ended up on the bottom of the ladder. We spoke about that today, making sure we show up hungry and motivated every game - otherwise, they will get ya. We’re coming up against Bendigo this weekend and we have to think about Adelaide first, we won’t get to train before we get to Bendigo. But Bendigo is a bit of a danger game, they will have been sitting at home for five days waiting for us and we have to make sure that we are mentally ready and that we can adapt to their different style. Zitina Aokuso has got fairly limited game time, but how have you see her growth? She’s been great. The league’s getting bigger and teams have been trying to get players to combat Suzy (Batkovic). Certainly, that’s a big part of Zitina’s role - defending Suzy at training, bodying up on her and trying to beat up on her, she’s certainly done that. It’s been tough for her getting minutes with our roster, but she’s definitely learned a lot from our bigs. It’s been a pretty big learning curve for her, she only came to basketball late, but she’s taken it in stride. How has the team found the return to television with Fox? Look, I think it’s great for the sport. It’s great for the Townsville fans, they really love watching us on TV when we go on the road. So, I think it’s been good and hopefully it continues. Oregon State alum Sydney Wiese has been a good fit for the Fire. Mar 21 WNBL: Coach Claudia Brassard talks Townsville Fire's title defence.